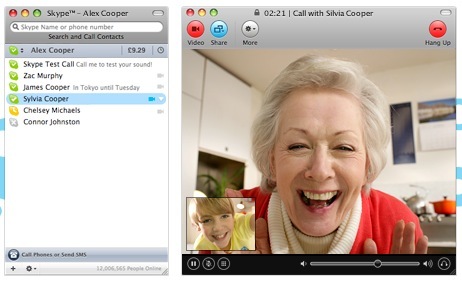 Skype launches itself automatically on either user login or system boot of Mac OS X. This is either helpful or annoying, depending on your needs. If you wish to stop Skype from opening itself automatically in OS X, you can do so easily using the methods outlined below. 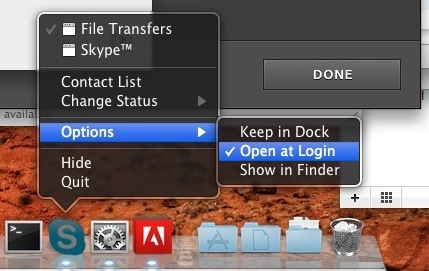 We will show you how to disable Skype from launching automatically the next time you start up or log into your Mac. This does not prevent Skype from working, it simply stops it from opening itself, meaning if you want to use Skype you’ll need to open it manually like a normal OS X app. Now the next time you login or boot up your Mac you shouldn’t see Skype launching itself. Just be sure that the “Open at Login” item is unchecked. You can also manually stop the auto-loading Skype app via System Preferences. I think it’s easiest to just disable the login items through the Dock icons, it’s less steps and a lot faster, but you can use whatever trick you want. The latter approach of managing your login items can also be helpful if you want to remove other apps from that automatic launch list. Whichever way you go, you’ll need to launch Skype yourself from the /Applications/ folder when you want to use the chat app. Unspecific to Skype, but related to application autolaunching behavior, check out a complete guide to Mac startup application launches and login scripts if you’re interested. I hope this isn’t a stupid question, but how did you get the black, semi-transparent menu? Is it Snow Leopard? Oh, no, I know how to access the menu… I meant, how do I get it in that color? Mine is white and completely opaque. I’ve tried changing my theme to graphite but this didn’t change the menu’s color at all. Exactly what I was looking for! Thanks! Thanks for the two solutions to the Skype launch on startup issue. I cannot believe the developer doe this, I will decide what and when things launch. I was about to throw a hissy fit when I couldn’t figure this out, when in fact it’s just another case of simplicity slapping me in the face.